miniPointe is a tiny agile air cutter specifically designed to produce sharp beam and aerial effects especially in venues constrained by size. Striking bright 0° parallel beams with glowing colours and static gobo wheel patterns can be multiplied by innovative Dynamic Flower Effect – DFE™ producing various different shapes of flower beams DFE™ dynamically changing in the air. 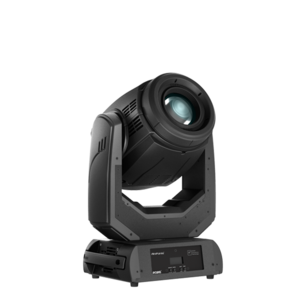 Fine tuned short arc of the Osram Sirius HRI 140 W RO lamp and optimized optical system pushes with ease through haze and fog. Smooth variable frost filter and and any one of the 13 rich colours is instantly ready to create a smooth instantly ready to create smooth even wash, extending the feature set of this petite but powerful Beam, Wash and Effect fixture.